Frank Henry Algernon Mason was an exceptionally talented artist. During the early 1890’s Scarborough had a colony of artists including Thomas Bush Hardy and Ernest Dade who could often be seen at work down on the harbour painting local views. Mason, who was inspired when watching them at work, taught himself to draw and paint. By 1893, the young Frank Mason was painting and sketching local views of the coast, but his status was still an amateur. Mason stated he “never had the smallest artistic training…. his only teacher was his natural instinct”. However, he eventually gave up engineering around 1895 to become a professional painter backed by regular commissions from Scarborough’s premier art dealer, Haydon Hare. 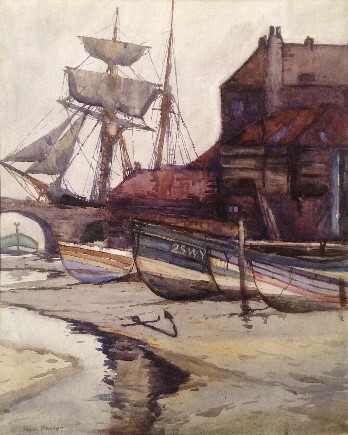 During the late 1890’s and the first decade of the twentieth century he painted many views of Scarborough, Whitby and the other ports and harbours of the North East coast. The principal art dealer in Whitby at this time was Mr E.E. Anderson’s West Cliff Fine Art Gallery at 24 Skinner Street. 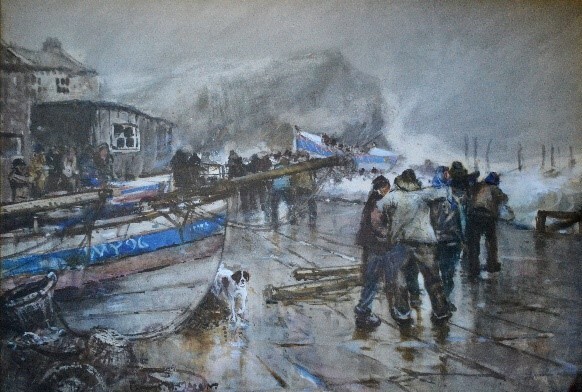 By 1902 Mason had been elected a member of the Staithes Art Club, known as the Staithes Art Group, where he was introduced to the bold plein-air technique of watercolour painting. In addition to becoming an established and well-respected artist Mason also had a career as a commercial artist, including illustration, and Railway Art. The vast majority of the poster designs were done for the London and North Eastern Railway [ LNER], particularly between the years 1927 and 1932 when he was one of their “Big Five” designers. On the nationalisation of the railways in 1948 he continued to receive commissions from the newly formed British Railways, completing over 30 poster designs up until his last poster in 1961. 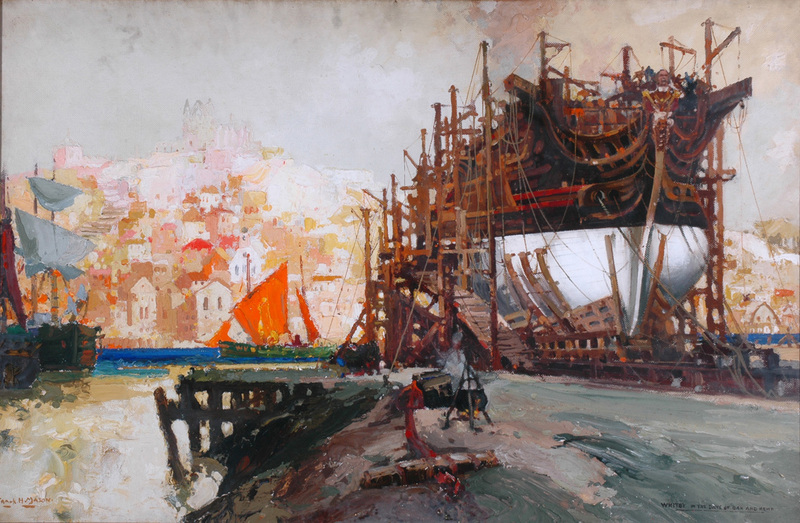 The Whitby Gazette of November 1938 announced that “Mr F H Mason, the celebrated marine artist, has painted a magnificent picture of Old Whitby Shipping to the commission of the London and North Eastern Railway for advertising Whitby next year. Mr and Mrs Mason and family are in residence at ‘Whitehall’, Whitby which he chose as being a suitable home for an artist whose principal subjects are the sea and shipping”. You can also see the Commercial art of Frank Henry Mason at Whitby Museum 16th June – 27th August. Both venues are open Tuesday – Sunday, 9.30am – 4.30pm, last admission 4pm. Admission to the Gallery is free. There is a charge for admission to the Museum, however, admission is free for children and for residents of the parish of Whitby.